A Fabulous Find for Champagne Lovers from Antica Farmacista! While on a recent trip to Sea Island, Georgia, I indulged in a relaxing massage at the Forbes Five-Star Cloister Spa & Fitness Center. The Spa was nothing short of fabulous and I was very impressed by both the facility and the service (if you have the chance to go, ask for Tim). I was also very impressed by the Spa Gift Shop which carried some very elegant product lines including one that really caught my eye: the Antica Farmacista Le Fragrance d'Ambiante or Home Ambiance Perfume. This beautiful product consists of an elegant, antique-inspired apothecary bottle that is filled with the fragrance of your choice which is diffused by white birch reeds inserted into the bottle. 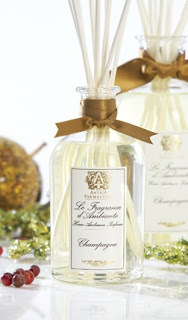 While they carried a variety of scents from this fabulous line, I was especially drawn to the one labelled...Champagne! The fragrance is described as having "top notes of satsuma citrus balanced with subtle floral notes of muguet, apricot, nectarine and passionfruit complemented by the sweetness of sugared black currant with mellow accents of sweet vanilla." I have to say it really does embody many of the aromas I love in Champagne. Needless to say, I was hooked! This product really does make a lovely presentation and, after living with it for a week or so, the scent is still light and lovely. 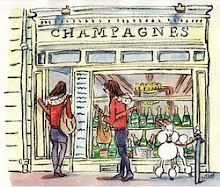 The only draw back: my constant craving for Champagne! For pricing information or to purchase this or other Antica Farmacista products check out their website by clicking here. Have you found any other Champagne or wine-scented products? Do tell! An Evening with The Sommelier All-Stars! Boulud & the Sommelier All-Stars! Last Wednesday night the stars aligned at New York's iconic eatery, DANIEL...the Sommelier All-Stars, that is. Chef Daniel Boulud assembled the best and brightest of his Sommeliers, led by Dinex Wine Director Daniel Johnnes, for an evening where the wine reigned supreme. Each of the seven Sommeliers selected two wines they found inspiring, and each duo was paired with a dish created to suit the wines. Bar Boulud and Boulud Sud Sommelier, Michael Madrigale commented, "It was nice to have the roles reversed. Normally we pick the wine to go with the food but tonight it's the other way around!" Guests were greeted with exquisite bubbly hand selected by DB Bistro Moderne Sommelier, Alexander LaPratt. A pair of 2004 Blanc de Blancs included an A. Margaine Willers-Marmery "Special Club" and a Pierre Moncuit Les Mesnil-sur-Oger which were served alongside passed hors d'oeuvres including Mille-Feuille of Smoked Salmon and Cream Cheese, Snail Cromesquis with Sweet Garlic and Wild Mushroom Pomponette with Fontina. Moncuit's offering stood up best to the array of delicacies and it was also interesting to learn that even this house's NV bottlings are from a single vintage, with no reserve wines added. The first course of the evening was helmed by DANIEL resident Sommelier, Raj Vaidya whose favorites manifested as a pair of '09 German Rieslings, the J.J. Prum "Wehlener Sonnenuhr" Spatlese and the Leitz "Rudesheimer Berg Roseneck" Spatlese served "aus magnum." Daniel Johnnes commented he'd hired Vaidya to develop the Burgundy section of DANIEL's wine list, while Vaidya declared it was his mission to turn Johnnes into a Riesling lover. While I can't speak for Johnnes, I was definitely compelled by Vaidya's choices and both Rieslings paired deliciously with the Duck Terrine with Marcona Almond and Honeycrisp Apple Confit. Next up, Daniel Johnnes stayed true to form with a duo of White Burgundies that included one of my favorites of the evening, the '09 Pierre-Yves Colin-Morey Saint Aubin 1er Cru "En Remilly." This delightful white featured perfectly balanced notes of stone, mineral and fruit that had me savoring every drop. Its counterpart was a '08 Jobard Meursault "Genevrieres" which was lush and lovely, and while both paired very nicely with the Crispy Scottish Langoustines with Minted Cucumber, I did prefer the Saint Aubin. We entered the realm of reds in the capable hands of Blue Pilkington, Sommelier at Café Boulud New York, whose selection of Burgundies elicited a collective grin from oenophiles in attendance. The '06 Sylvain Cathiard Chambolle-Musigny "Les Clos de L'Orme" was refined and elegant while the '07 Domaine Dujac Chambertin Grand Cru was comparatively rich and decadent and remarkably approachable for such a young Grand Cru. Both wines harmonized beautifully with the Duo of Veal featuring Caramelized Sweetbreads and Tenderloin with Black Trumpet Mushrooms. Next came the inspired Rhone selections of Michael Madrigale, Sommelier of Bar Boulud and Boulud Sud. Known for his predilection for large formats, Madrigale did not disappoint with a '07 Domaine Guillaume Gilles Cornas "en magnum" and a '06 Pierre Usseglio Chateauneuf du Pape "Mon Aieul" "en jeroboam." The Cornas' initial whiff of black olive tapenade evolved into delightful savory, gamy notes while the young Chateauneuf had big flavors of blackberry, plum, licorice and appreciable tannins. This savor-worthy duo was paired with an earthy dish of Grouse with Huckleberries, Brussel Sprouts and Parsnips that deliciously enhanced nuances of both wines, making this my favorite overall pairing of the evening. Prior to the dessert course, Chef Boulud emerged with a light-hearted challenge for Sommeliers and diners alike. Each table was presented with two wines, one white and one red, and charged with the task of blind tasting and identifying each. Considering the present company, this challenge was simultaneously titillating and terrifying. Thankfully, the Sommeliers' answers were presented first and, while close, there were no spot on matches. Chef Boulud's selections were somewhat obscure: a 2005 Sogno Due Falanghina from Campania and a Northern Rhone selection, the '04 Domaine Florentin St. Joseph. 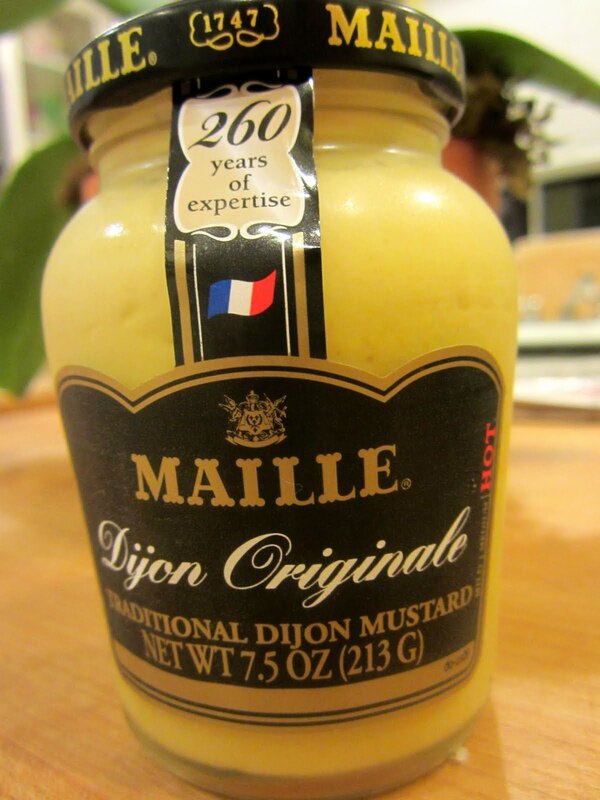 There was much laughter and good-natured ribbing as the Somms chided Boulud for his "cheap" selections. Boulud then proceeded to blind taste a red wine and came remarkably close to identifying it; he guessed a '09 Cru Beaujolais to be a Chirobles or a Fleurie. With the next course, Sommelier Kerri O'Brien of DBGB Kitchen and Bar introduced two unique "orange" wines. The '06 La Stoppa "Ageno" from Emilia-Romagna had a heady, perfumey aroma that was very similar to Tiffany eau de parfum, so much so I was tempted to dab some behind my ears. To drink, I preferred the '02 Berthet-Bondet Vin de Paille Cotes du Jura that paired remarkably well with the the cheese course of Tete de Moine, Vieux Comte, Langres and Bayley Hazen Blue. The final say was had by Sommelier Mariya Kovacheva of Café Boulud Palm Beach, and her selection of Italian wines paired with dessert were also among my favorites of the evening. The '07 La Roncaia Picolit was lightly honeyed with a lovely acidity while the '08 Corte Sant' Alda Recioto della Valpolicella featured muted notes of plum, vanilla and spice. Both selections were delightfully elegant and well-balanced, so much so, I kept forgetting about the chocolates and petit fours in front of me, and that doesn't happen very often! I did manage to sneak a few of Boulud's signature madeleines though. All in all it was a very special and memorable evening. While chatting with Chef Boulud after dinner, he asked us if we had lunch plans the following day and proceeded to make us reservations at his newest restaurant, Boulud Sud. Who were we to say no? That review to follow! Fast & Fabulous: Chicken Breasts with Artichoke-Olive Sauce! While I do love my recipes for entertaining, another passion of mine is finding dishes that can be prepared in a minimum of time and don't skimp on flavor. These are real gems indeed, and that's what the Fast & Fabulous segment is all about. For all you fans of Mediterranean cuisine, here is a delightful recipe that delivers all those mouth-watering flavors in thirty minutes or less. I came across this recipe for Chicken Breasts in Artichoke-Olive Sauce from Philadelphia Chef Marcie Turney in the September issue of Food & Wine Magazine. Turney and her business partner own three restaurants, each inspired by a different country including Mexico, the Mediterranean and India. The magazine featured recipes based on each and while I do love Mexican and Indian food, my love of Mediterranean-inspired cuisine prevailed and I just had to give this dish a try. One thing I love about this recipe is you can take a bit of artistic license and add more or less of whatever ingredient you prefer without any major consequences - hello, feta! Envision the aromas of freshly squeezed lemon juice, minced garlic, fresh oregano and chopped kalamata olives along with the salty tang of Feta cheese and the delicious flavor of artichoke hearts being prepared in your very own kitchen! Although my husband, Steve is not the biggest fan of olives, I have been determined to convert him. It worked with capers, after all and I think I finally might have succeeded! Serve this dish with a crisp, racy white wine like a Greek Moschofilero (mo-sko-FEEL-ero). This is a white worth trying if you haven't had the chance already. It's characterized by a vibrant acidity, notes of citrus and spice with a hint of tropical fruit on the finish. Food & Wine recommends the 2010 Domaine Skouras Moschofilero but for those of you who reside in Palm Beach County, the 2010 Boutari Moschofilero Mantinia is readily available at many local wine stores. I hope you enjoy this recipe for Chicken Breasts in Artichoke-Olive Sauce as much as we did! It's healthy, flavorful and very easy to make and I am definitely adding it to my regular rotation. I would love to hear what you think of it! Preheat the oven to 400 degrees. In a bowl, whisk 1/4 cup of the oil, lemon juice, zest , garlic and oregano. Fold in the artichokes, olives and feta; season the sauce with salt and pepper. Season the chicken with salt and pepper. In an ovenproof skillet, heat the remaining 1 tablespoon of oil. Add the chicken, skinned side down, and cook over moderately high heat until browned, 3 minutes; turn and transfer the chicken in the skillet to the oven. Roast the chicken for 10 minutes until white throughout. Transfer the chicken to plates and spoon the sauce on top. Garnish with the parsley and serve. 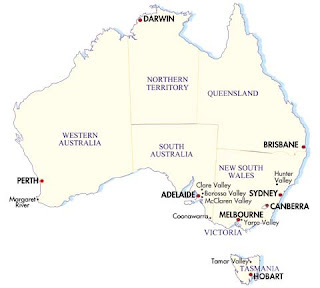 The Diversity of Australia: Some Interesting Wines from Down Under! 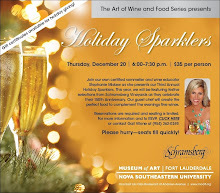 Despite Hurricane Irene's best efforts, our monthly installment of "The Art of Wine & Food" at the Museum of Art, Ft. Lauderdale went off without a hitch! The evening's theme was "The Diversity of Australia," and instead of the typical Shiraz and Riesling many people associate with the land down under, the evening featured varietals a little off the beaten path. To accompany the wines, Chef Marci Boland of L'Hermitage Catering created some delicious dishes that complemented the wines beautifully. The first wine of the evening was the 2008 Turkey Flat Butchers Block White hailing from the Barossa Valley. Located in the state of South Australia, the Barossa Valley is one of Australia’s oldest and best-known wine regions. 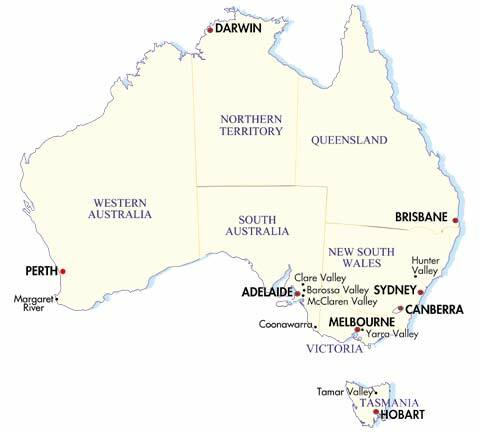 It's home to Australia's largest wine companies as well as plantings of Grenache and Shiraz that are over a century old. The popularity of Shiraz (aka Syrah) in this region sparked interest in the development of other Rhone varieties. The 2008 Turkey Flat Butchers Block White is a blend of 58% Marsanne, 28% Viognier and 14% Roussanne, grapes indigenous to France’s Rhone Valley. This wine has appealing flavors of citrus, pear and green apple with a hint of toasty oak from partial barrel fermentation and a richness from extended lees contact. This wine is ideal for pairing with richer seafood dishes like scallops and lobster or those with exotic spices such as Thai, Curry or Indian cuisine. Chef Marci prepared a delicious Curry Coconut Chicken that paired very nicely with the spice and citrus notes of the wine. The second wine of the evening was the 2009 Robert Oatley Mornington Peninsula Pinot Noir. Proud and passionate Australian, Bob Oatley is considered by many to be a pioneer of Australian wine. His successes include the family-owned Australian winery Rosemount Estate and his latest endeavor, Robert Oatley Vineyards, is built around the family’s vineyard holdings and winery in New South Wales. The Mornington Peninsula is located in the Australian state of Victoria is known for its cool, maritime-influenced climate, ideal for growing Pinot Noir and Chardonnay grapes. The 2009 Robert Oatley Mornington Peninsula Pinot Noir has delightful cherry aromas with hints of strawberry, earth and spice; the 10 months in French oak nicely enhances but doesn't overpower the character of the wine. This Pinot Noir would be delicious served slightly chilled with dishes like seared tuna, grilled salmon or roasted duck with cherry sauce. Guests enjoyed it paired with Chef Marci's Tomato Provencal with Prosciutto, Thyme, & Garlic. The final wine of the evening was the 2008 De Bortoli Deen Vat 4 Petit Verdot from the Riverina wine region in New South Wales. De Bortoli Wines is a third generation family winery established by Vittorio and Giuseppina De Bortoli in 1928. Deen De Bortoli personally selected the blends and chalked the numbers on the vats to identify them. The Vat Series includes traditional varietal wines and also wines made from interesting varietals newer to Australia. Petit Verdot is one of Bordeaux’s classic grape varieties that is currently enjoying a revival in Australia. 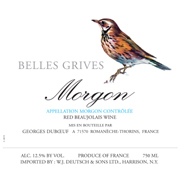 This late-ripening varietal performs exceptionally well in Australia's warm climate which allows it to achieve heightened levels of ripeness compared to the cooler climates of France. The 2008 De Bortoli Deen Vat 4 Petit Verdot has aromas of blackberries, cherries, and violets. On the palate, rich dark fruit, chocolate and spice accompany chewy tannins imparted by oak ageing. This wine is perfect for pairing with smoked meats, roasted or grilled lamb or veal chops, and/or a big, juicy steak. It paired remarkably well with Chef Boland's Zinfandel Braised Short Ribs with Pasta. Guests really enjoyed these edgy Aussie wines which many were unfamiliar with prior to the event. They certainly sparked lots of interesting questions and conversation throughout the evening. Many participants said they especially enjoyed experiencing how the flavors of wine and food can really complement and enhance each other - I just love hearing that! A big thank you to Republic National Distributing Company for providing the wines for this event. Please join us for our next installment of "The Art of Wine & Food," entitled "Chardonnay Around the World: Learn how Winemaking Styles Exhibit Qualities of Old Hollywood Glamour." It should be an interesting evening! For more information, please contact Gail Vilone at gvilone@moafl.org or call 954-262-0249.